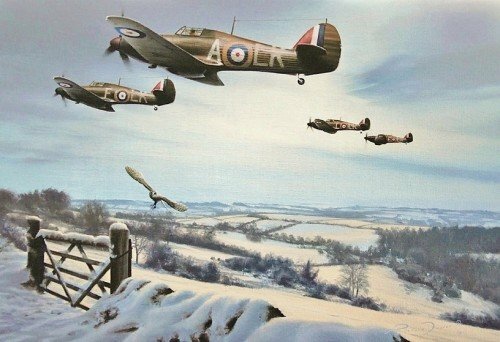 Richard Taylor’s superb painting Winter Combat hints at the bitter fighting that lies ahead. A few months ago they had been fighting for their lives during the Battle of Britain but for now the snow-clad tranquility of an English winter brings a brief, but welcome, relief for the Mk.1 Hurricane pilots of 87 Squadron. THE SIGNATURES Joining artist Richard Taylor in creating this new tribute to the Hurricane, each print is signed by three highly respected Pilots who flew this wonderful aircraft in combat during World War II.